This will be the only kind of advertising you’ll see from me on this blog. I don’t (and prefer not to) talk about my previous incarnation as an IT professional, but I have to talk about the awesome FIRST Robotics Competition. Take high school students, engineering mentors, and lots o’ machinery and you have the foundation for the robotics tournament. Sure the rules of the games can be highly contrived, but the engineering to compete is anything but. What kind of force does a launcher need to kick a ball through a goal? What’s the best way to pick up rubber tubes? How can a robot grip a pole more efficiently to climb it faster? The math behind these problems is elegant enough, but then to go from paper and theory to actually having some applied answer? Results that you can test and reconfigured? Perhaps I’m projecting a bit of my frustrations in the lack of easily quantifiable results for the conservation work I’m doing. But still, these kids are doing marvelous things. Playoffs are on Saturday, March 26. I’ll be there rooting for Team ‘Iolani! The atmosphere is competitive, goofy, nerdy… and wonderful. 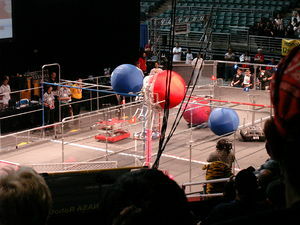 This entry was posted in Random and tagged FIRST Robotics Competition. Bookmark the permalink.